The Seahawks Players Equality & Justice for All Action Fund, which was formed by players last fall “in an effort to create lasting change and build a more compassionate and inclusive society,” has awarded its second round of grants, with a total of $225,000 going to eight organizations. Seahawks left tackle Duane Brown announced Wednesday that the grants, which range from $25,000 to $50,000, will go to organizations that focus on homelessness, criminal justice and bail reform, and education. Grants focused on fighting homelessness were awarded to Cocoon House, FareStart and Mary’s Place. In the area of criminal justice and bail reform, grants will go to Northwest Community Bail Fund, Creative Justice, Public Defender’s Association, and the Community Justice Project. And for education, a grant was awarded to MoHundred. You can find information on all eight organizations below. This is the second round of grants given by the action fund, which in just over a year has raised more than $1.2 million. In December, grants ranging from $15,000 to $25,000 were given to seven organizations. Grants are funded by donations made by fans and supporters from all over the world, by Seahawks players and staff, by Paul G. Allen Philanthropies, by the Carroll Family Fund, by John and Traci Schneider, by Microsoft CEO Satya Nadella’s Nadella Family Trust, and by Starbucks and the Starbucks Foundation. The action fund is housed at the Seattle Foundation, a nonprofit that manages nearly $1 billion in philanthropic investments. Donate to the Seahawks Players Equality & Justice For All Action Fund here. 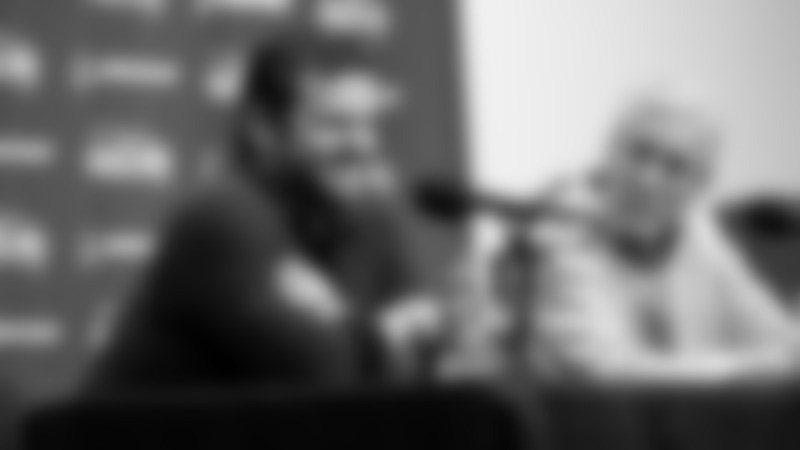 Brown, who was acquired in a midseason trade in 2017, wasn’t on the team when the action fund was launched, but quickly realized after joining the team that his values aligned closely with those of many of his teammates. “I was kind of taken aback by how involved everyone was in the community when I got here,” Brown said. “It really shows that guys aren’t just talking about it, everyone is putting things into action, putting money behind it. As players in our position, we’re obligated, I feel like, to help the community. Everyone is pretty passionate about it in these different areas—homelessness, criminal justice and education—they’re things that can really, really affect our future. Originally founded in 1991, Cocoon House empowers young people to break the cycle of homelessness through dedicated outreach, housing and prevention services throughout Snohomish County. Cocoon House offers short- and long-term housing to homeless young people ages 12-17 years old, and their children. Additionally, they provide emergency supplies, hygiene and food packs, and access to local resources to young people ages 12-24 years old experiencing homelessness. Providing much more than a safe place to sleep, teens receive help engaging in school, job readiness training, life enrichment skills, and help accessing community services on- and offsite, while planning for long -term housing. They are currently raising funds to develop a new housing complex that will provide 100 youth with secure housing each year. Arlington (North): Home for pregnant or parenting teenage mothers and their children. Since 1992, FareStart has transformed the lives of homeless men, women and families by empowering them to achieve self-sufficiency through life skills, job training and employment in the food service industry. Students in their Adult Culinary Program receive 500 hours of on-the-job training in FareStart’s foodservice businesses working alongside chef instructors and learning culinary skills to prepare them for jobs in restaurants, catering, corporate dining and grocery stores. Of the students who enroll in the Adult Culinary Program, 87 percent are homeless at the time of enrollment. Twenty percent of the women in that program are custodial parents. Last year, 90 percent of their graduates found employment within 90 days of graduating. At six months, 85 percent of graduates were still employed. In 2017 FareStart served a total of 647 homeless individuals. Mary’s Place was established in 1999 as a day center for women experiencing homelessness. Today they have expanded to operating 8 shelters throughout King County, and provide emergency shelter to just over 500 moms, dads, and children nightly. Additional services that Mary’s Place offers include support for mothers with newborns, families with critically ill children, employment and housing resources, hygiene and laundry service, case management, a kids club, and health, food and nutrition support. Northwest Community Bail Fund (NCBF) is a nonprofit organization working to minimize the harm of the cash bail system by paying bail for people who would otherwise spend the pre-trial time in jail, and advocating for bail reform. NCBF works to ensure that people accused of low-level crimes have an equal opportunity to defend themselves from a position of freedom. They provide cash bail for people who are unable to pay due to poverty, who are charged with misdemeanors in King and Snohomish counties and have no other holds. They also provide support navigating the legal process with the aim of reducing pre-trial incarceration and reducing the pressure to plead guilty. They see bail reform as the first step toward ending the criminalization of poverty and mental illness, and guaranteeing equal justice for all. In just over 20 months, NCBF has prevented more than 5,900 days of pre-trial detention. They have posted an average bail amount of $1,600, freeing over 100 people. This has saved taxpayers over $1,000,000 by paying just under $175,000 total in bail. In collaboration with mentor artists, participants consider the root causes of incarceration and focus on the positive role youth voice can have in building a more equitable justice system for the region. Creative Justice has built a relationship with the King County prosecutor’s office to offer arts-based instruction for youth, who by completing the program can have their criminal charges reduced or dropped, avoiding unnecessary time spent in a non-rehabilitative juvenile detention center. Through this approach, Creative Justice addresses mass incarceration by offering young people the tools to avoid the traps that cause crime and demand change from the system itself. Additionally, young adults who have yet to have their juvenile criminal convictions sealed because of unpaid restitution bills often face major obstacles to employment and housing. Creative Justice recently received seed funding to develop a Restitution Relief Fund so youth in their program will review and collectively recommend cases where restitution fines will be paid off entirely. Ongoing fundraising is necessary to develop a web-based and mobile donation platform so that more Restitution Relief funds are available. The Public Defender Association (PDA) works in the area of policy advocacy, litigation and organizing on issues that systemically affect people who are or are likely to be engaged by the criminal justice system. Through VOCAL-WA, PDA supports individuals and communities that are directly impacted by the War on Drugs to organize for solutions to drug use that are rooted in health, safety and compassion. PDA has effectively participated in a profound shift to a public health paradigm for drug-related crime. PDA’s Racial Disparity Project works to improve police accountability and reconsider the role of the police in the community. Rather than criminalize individuals through an approach that relies on arrest, prosecution and punishment, Project LEAD works with police officers to allow an alternative to arrest at the point of contact by diverting individuals to a community-based intervention program for low-level criminal offenses like drug possession, drug sales and prostitution. Community Justice Project is, building innovative healing responses to harm rooted in restorative justice principles, meaningfully investing in the leadership of the most marginalized survivors to lead this work, and shifting the public narrative to accurately reflect the needs of King County’s most marginalized survivors. They are piloting a 12-month circle program in Washington prisons, the first of its kind in Washington state. Drawing on a restorative justice and trauma healing philosophy in a supportive setting, they explore topics such as trauma, resiliency, accountability, structural and historical conditions of violence, shame and worth, cycles of violence, and impact on victims/survivors. This program was launched in December 2017 in Monroe Correctional Complex. In 2019 they plan to initiate the program in two new prisons. For survivors in the community, they offer a circle parallel to the prison circles and similarly based in restorative practices and trauma healing. The circles culminate in opportunities for survivors to share their stories with in-prison groups, when appropriate. Lastly, through leadership development, organizing trainings and political education, they hope to provide survivors, who are traditionally left powerless in the system, with the ability to advocate for policy change processes themselves. The MoHundred Scholarship is a partnership between the College Success Foundation (CSF) and MoHundred. MoHundred ensures student eligibility (GPA, FAFSA completion, enrollment status) is maintained and CSF manages and administers the funds to the institutions. In 2016, National African-American Parent Involvement Day (NAAPID) was celebrated at South Shore PK8 School in Seattle. NAAPID is national holiday celebrated in February that promotes family engagement, recognizes the brilliance of Black students and affirms education as a cultural value of the African diaspora. The event called for one hundred Black men to greet and usher students into school with enthusiastic high fives. In an extraordinary act of civic involvement, 256 answered the call. NAAPID influenced the formation of MoHundred by ten community volunteers to support the academic goals, social-emotional learning, and cultural identity of Black children. Formed of diverse Black men and fathers from the community, MoHundred members include: Anthony Shoecraft (City of Seattle), Kirk Mead (Washington Federal), Chukundi Salisbury (100 Black Parents), Chinua Lambie (Providence St. Joseph Health), Allen Branch (HoneyWell), Earl Parker, Jr. (Port of Seattle), Les Liggins (Seattle Police, retired), Aaron Bossett (Axum Analytics), Sean Connor (Microsoft), Kevin Baker (Consultant). A Detroit-based organization that learned of NAAPID’s success pledged in 2016 to grant $10,000 scholarships to ten Black male high school graduating seniors from the Seattle area. This organization never fulfilled its promises to these young men which significantly and negatively impacted their educational plans. One young man delayed enrollment, another dropped out after first semester due to financial hardship, while the remaining families were forced to take out more loans. MoHundred decided to stand in the gap for these young men and rally the local community around them and their families to help make their college dreams come true by creating the MoHundred Scholarship. 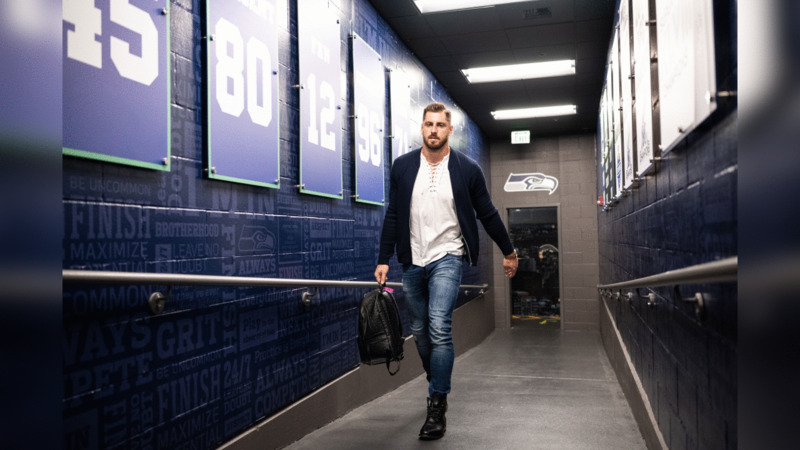 Tight end Nick Vannett arrives at CenturyLink Field and walks the hallway from the players parking lot to the locker room. D.J. Fluker and Rashaad Penny arrive at CenturyLink Field for the game against the Rams in Week 5. Head coach Pete Carroll heads for the locker room with a network television camera capturing his arrival. Seahawks center Justin Britt sports gloves honoring the NFL's Crucial Catch initiative. Defensive tackle Shamar Stephen is one of the first players on the field for early warmups. Quarterback Russell Wilson, wearing his Bose headphones, takes his early warmup throws in an empty stadium before fans arrive. Receiver David Moore makes a practice reception in the south end zone during early warmups, at nearly the identical spot where he would catch a touchdown pass hours later in the game. Cornerback Shaquill Griffin warms up. Seahawks legends Seneca Wallace and Walter Jones pose for a photo before the game. Jones, now a photographer, photographed the game from the sidelines. Tight end Marcus Lucas is all smiles as he exits the locker room for early warmups. Back in the locker room, receiver Brandon Marshall reviews notes at his locker. Defensive captain Bobby Wagner talks to the team before they left the locker room for kickoff. Offensive guard J.R. Sweezy gets ready to run out of the tunnel during pregame introductions. Seahawks cornerback Shaquill Griffin spreads his wings and "flies" onto the field as his name is called during pregame introductions. Defensive tackle Jarran Reed poses in the laser-lit tunnel during pregame introductions. Seahawks defensive backs Akeem King and Tedric Thompson sit on the bench before kickoff. Seahawks helmets sported stickers honoring the NFL's "Crucial Catch" initiative during the game. Seahawks captains head to midfield for the opening coin toss. Head referee Clete Blakeman flips the coin as captains for both teams watch. Seattle's defense came up with a red zone turnover early in the game as Frank Clark intercepts this tipped pass, thwarting a Rams drive. Seattle's Frank Clark returns an interception in the first quarter for 26 yards. Seattle's Chris Carson barrels his way for 16 yards on this first quarter carry. Seattle's Mike Davis races to the right side for a nine-yard gain. Seattle's Russell Wilson sends a shovel pass towards tight end Nick Vannett that resulted in a first down. Seattle's Mike Davis celebrates in the end zone after scoring from six yards out to give the Seahawks a 7-0 lead. Seattle's Justin Coleman tackles Rams running back Todd Gurley. Seahawks tight end Nick Vannett heads downfield for a 32-yard gain after catching a shovel pass from quarterback Russell Wilson. The Sea Gals were dressed for the light drizzle that fell for most of the game. Seattle's Tyler Lockett hauls in a 39-yard touchdown pass from Russell Wilson in the second quarter. Seattle's Tyler Lockett celebrates with teammate Duane Brown after Lockett's second quarter touchdown gave the Seahawks a 14-10 lead. Seattle's David Moore stiff-arms L.A.'s Ramik Wilson in the second quarter. Seattle's Sebastian Janikowski connects on a 52-yard field goal in the second quarter to tie the game at 17-17. Seattle's Barkevious Mingo and Bobby Wagner combine to stop the Rams' Cooper Kupp. Seattle's Tedric Thompson intercepts the Rams' last minute hail mary attempt at the end of the first half. The halftime show featured men and women on the field celebrating those close to them affected by the cancer as part of the NFL's Crucial Catch initiative.  Mike Davis heads up the sideline accompanied by Russel Wilson who looks to make a block. The Seahawks celebrate after Moore's touchdown is upheld upon an official review. The 12s were loud and boisterous all afternoon at Century Link Field. Seattle's Tedric Thompson stops the Rams' Josh Reynolds in the third quarter. Seahawks running back Chris Carson takes off on a 21-yard gain in the third quarter. Carson rushed for 116 yards in the game. Offensive line coach Mike Solari gives instructions during the second half. Seattle's David Moore finds himself open near the end zone and hauls in a 30-yard touchdown pass from Russell Wilson. Seattle's Shaquem Griffin dives at Los Angeles returner Blake Countess. Injured Seahawks linebacker K.J. Wright shouts instructions from the sidelines. Seattle's Barkevious Mingo tackles Rams tight end Gerald Everett. Seattle's Tyler Lockett gets grabbed by the face mask after coming down with a 44-yard reception as the Seahawks tried to get into scoring position late in the game. After the tough 32-30 loss to the Rams, head coach Pete Carroll addressed the team in the locker room.